A Interim Group Management Report 5 Executive Summary 12 Property-Casualty Insurance Operations 22 Life/Health Insurance Operations 28 Asset Management 32 Corporate and Other 35 Outlook 37 Balance Sheet Review 44 Reconciliations Interim Report Third Quarter and First Nine Months of 2014 Allianz Group 5 Executive Summary Third quarter 2014 −− Revenues grew strongly by 14.5 % to € 28.8 bn. −− Operating profit increased by € 132 mn to € 2,650 mn. −− Net income at € 1,687 mn, up by € 157 mn. −− Solvency ratio strong at 184 %.1, 2 ­Allianz Group overview ­­­­Allianz  SE and its subsidiaries (the ­Allianz Group) have opera- tions in over 70 countries. The Group’s results are reported by business segment: Property-Casualty insurance operations, Life/Health insurance operations, Asset Management and ­Corporate and Other. 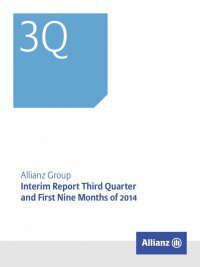 Key figures key figures ­Allianz group € mn three months ended 30 September 2014 2013 Total revenues 28,781 25,144 Operating profit 2,650 2,518 Net income 1,687 1,530 Solvency ratio1,2,3 in % 184 182 Earnings summary Economic and industry environment in the third quarter of 2014 Overall, global economic activity continued to trend moderately upwards in the third quarter of 2014. However, both inter-regional and intra-regional growth differentials remained substantial. This holds true, in particular, for Latin America and emerging Asia, but also for North America and Europe. InEurope,theEuropeanCentralBank (ECB)cutthemainrefinanc- ing rate from 0.15 % to 0.05 %, raised the penalty deposit rate for banks to minus 0.2 %, and announced in September that it is considering purchasing asset-backed securities and covered bonds. In the United States, the Federal Reserve (Fed) continued to gradually lower the monthly volume of its asset-purchasing program. The increasingly divergent monetary policy stance of the ECB and the Fed, together with stronger economic growth in the United States than in the Euro- 1 Solvency according to the E.U. Financial Conglomerates Directive. Conglomerate solvency ratio as of 30 September 2014 was adjusted for the potential calls of hybrid capital (subordinated bonds) of € 1.4 bn in the coming year. Excluding this adjustment, the solvency ratio would be 190 % as of 30 September2014. 2 Off-balance sheet reserves are accepted by the authorities as eligible capital only upon ­request. ­Allianz SE has not submitted an application so far. Excluding off-balance sheet reserves and adjusted for the poten- tial calls of hybrid capital (subordinated bonds) of € 1.4 bn in the coming year, the solvency ratio as of 30 September 2014 would be 176 % (31 December 2013: 173 %). 3 2013 figure as of 31 December 2013. zone, contributed to a pronounced weakening of the Euro against the U.S. Dollar. The U.S. Dollar to Euro exchange rate was 1.26 at the end of the third quarter (1.37 at the end of the second quarter). Yields on 10-year German government bonds continued to decline and closed the quarter at 0.9 % – one percentage point lower than at the beginning of the year. After slowing in the second quarter, spreads on government bonds in the Eurozone periphery continued to tighten in the third quarter of 2014. This was in spite of lower benchmark bond yields and rising doubts about the robustness of the economic recovery in several European economies, as well as geo­ political risks related to Ukraine and the Middle East. Equity markets in most emerging and mature economies ended the third quarter below the levels at the beginning of this three-month-period. The insurance industry has developed fairly well in 2014, not least due to the relatively benign natural catastrophe environment: insured natural catastrophe losses were markedly below the long- term average. However, headwinds remained, namely ultra-low investment yields and tighter regulation.